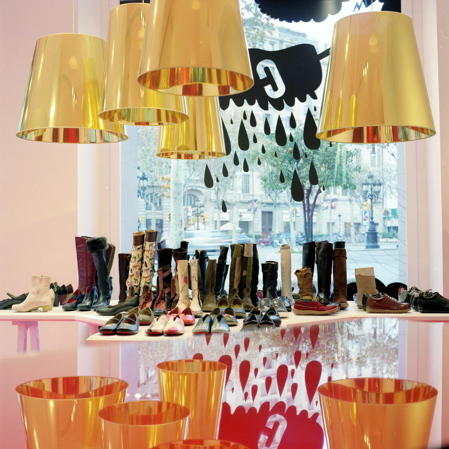 Jaime Hayón has sent us images of his new Barcelona store for Spanish shoe brand Camper. "The Camper shop was a chance to merge different elements of two very strong personalities, Camper's and my own, without sacrificing either. The intention was to give an absolute yet subtle change to the way the Camper space is envisioned. "To promote a luxury ambient inside the shop, turning it into a symbol of elegance. Very special pieces were created for this shop: handmade wood tables with different and abundant legs, very much within the Hayon style. "A set of hand crafted terra-cotta lamps was designed specially for the space. A new technology was developed to give these lamps an earthy yet sophisticated surface. "Red was also a key element to the shop's conception. It is the Camper color and has a very precise and important role in the shop. For the cash point space, we created an unusual piece of furniture with a very "Olympic" shape, all in red. We chose a red floor in resin of a silky and glossy effect that playfully contrasts the rest of the space. The graphical intervention of the shop seeks to celebrate the Camper/Hayon project. It was specially created for this theme, to express the enthusiasm behind the "togetherness".